Tibco Rendezvous Online Test assists Recruiters and Hiring Managers to assess the skills of the candidate about Tibco Rendezvous before hiring. Tibco Rendezvous uses messages that enable distributed application programs to communicate across the variety of hardware platforms and programming languages. Rendezvous Tibco skills test is specially designed to effectively assess the application and enterprise integration skills of Tibco Rendezvous developer- as per Industry Standards. Tibco Rendezvous recruiting test enables employers and recruiters to identify the right fit candidate by evaluating working skills and job readiness. For this reason, the emphasis is laid upon evaluating the knowledge of applied skills gained through real work experience, rather than theoretical knowledge. This Tibco Rendezvous interview test is designed by our subject matter experts to evaluate knowledge of an applicant. Using powerful reporting, you can have a detailed analysis of the test results to help you make a better hiring decision and predict the candidate’s performance. Tibco Rendezvous Assessment Test may contain MCQ's (Multiple Choice Questions), MAQ's (Multiple Answer Questions), Fill in the Blanks, Descriptive, Whiteboard Questions, Audio / Video Questions, LogicBox ( AI-based Pseudo-Coding Platform), Coding Simulations, True or False Questions, etc. Q 1. Your back-end processing supports multi-threading and you plan to leverage this capability in the context of a Rendezvous distributed queue (RVCMQ) subscriber by running five concurrent threads. Which statement is correct? RVCMQ scales by multiple program instances (horizontally), not by multi-threading (vertically). Each distributed queue member receives as many messages as specified by the scheduler configuration (the scheduler tasks parameter must be set to 5 or greater). Each distributed queue member receives as many messages as specified by the worker tasks parameter (the worker tasks parameter of each queue member must be equal to or greater than 5). Each distributed queue member receives as many messages as it dispatches (nothing needs to be done from an RVCMQ standpoint as it is a matter of the multi-threaded message dispatching). Which menu option shown in the exhibit is used for setting the default service and network for Rendezvous secure daemons (RVSDs)? 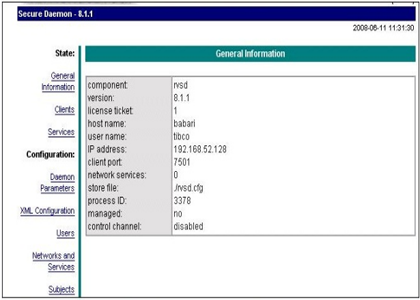 Q 3. tibrvlisten is started with the following settings: -network ";224.2.2.2;224.6.6.6" "mytest"
tibrvsend is started with the following settings: -network ";224.6.6.6;224.2.2.2" "mytest". "message #1"
The listener receives "message #1" only when runs on a different host than the sender. The listener does not receive "message #1" when runs on a different host than the sender. The listener will receive the message only if both the listener and sender run on the same host. The listener will receive the message only if both the listener and sender connect remotely to the same daemon.